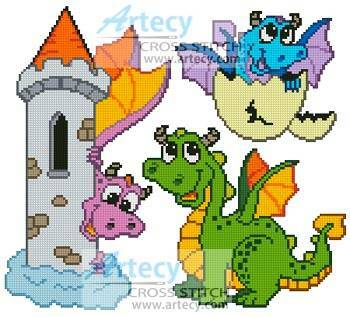 Cute Dragon Set cross stitch pattern... This counted cross stitch pattern of a set of 3 cute Dragon designs was created from an image copyright of Klara Viskova - Cutcaster. Average Stitches for each design 100w x 80h. Only full cross stitches are used in this pattern.